One of the most important feature of the Max-Prop is that it feathers automatically with the forward momentum of the boat. 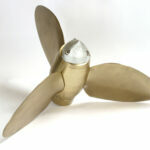 Once feathered, it provides the least possible drag (similar to a folding prop) improving the vessel’s sailing speed by an average of 15% above a conventional fixed blade propeller. 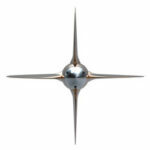 In forward: the Max-Prop will offer 96% of the efficiency of a fixed blade propeller of the same diameter and pitch. The 4% loss in power can usually be eliminated by precisely matching the pitch of the Max-Prop to fit the boat engine combination. 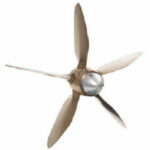 The Max-Prop uses a “differential” type design so that the blades cannot fail to open in forward or reverse. This positive system eliminates the problem associated with a folding propeller and its use of centrifugal force to open the blades. In a recent survey of Seven Sea Cruising Association readers the Max-Prop received a perfect rating on no failures ( one of only two products to receive such high praise). About 32,000 Max-Prop are in operation today! The Max-Prop offers the possibility of pitch adjustment without external controls. Changing the pitch is very simple; it is done by changing the setting of the gear inside the propeller (usually upon a haul out). The ability to adjust the pitch will help achieve the maximum efficiency from the engine without having to purchase a new propeller. On the new V.P. model the pitch is adjustable externally. The Max-Prop will fit directly onto your existing shaft when the boat is hauled for installation. 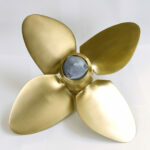 The Max-Prop will be matched to your specific shaft taper and can even be fitted on a Sail-Drive unit. The only required maintenance is to grease the propeller at least every other year (all the new Max-Prop are fitted with grease fittings). 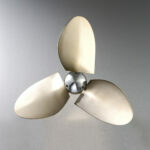 Worldwide, many of the top racing boats have opted for the Max-Prop solution. 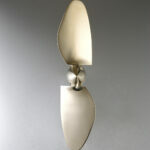 The two or the three blade Max-Prop is the propeller of choice for the cruising sailor. The combination of low drag, increased speed, outstanding backing power, safety and maneuvering, and fail safe design makes the Max-Prop the ideal cruising propeller.